A smarter energy project portfolio. Make your resources go further, plan projects more effectively, and manage work across your team, consultants & partners. Manage your whole portfolio in one organized view, watch work as it happens, and drill down when you need the details. Arkit makes it easier to manage a wide range of energy projects - from wells, facilities, assets and pipelines, to acquisitions, construction, monitoring, spills, compliance, HSE, inactive sites and more. It's one organized system to track of all your work, with project filtering, instant search and one-click access to all the details. To maximize budgets and streamline consultant work, Torc Oil & Gas deployed Arkit across Environmental, Health & Safety and Regulatory Compliance. Take control of your data with an intuitive system that helps you and your consultants capture, manage and organize a wide range of site information - budgets, AFEs, cost reports, tasks, land and facility details, field data, and much more. Arkit brings information together as sites progress through phases, stages and statuses, giiving you an organized system to track work and find data when you need it. Arkit is easily configured to track the projects, processes and data you need. 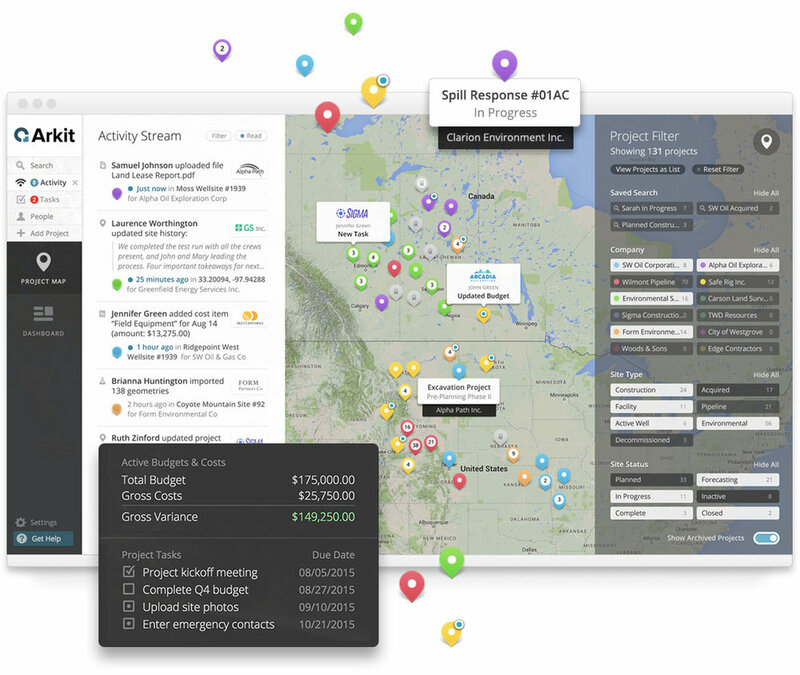 Intuitive tools make it simple to assign work to outside companies and track project progress. Successful energy projects rely on effective teamwork internally, and often across multiple companies. Share a project with a contractor, plan a site with a consultant, request a site assessment, monitor cost reports coming from the field - Arkit makes all kinds of collaboration easy, while keeping you in control and keeping your data safe. Arkit frees up time and resources without sacrificing job quality. Site planning is easier, managing data is quicker, and collaborating across teams and companies is improved. With pressure to cut expenditure and maximize budgets, Arkit gives your team a cost-effective system to get more done, and do it better. Arkit's all-in-one toolset helps you maximize resources across more projects. Learn how Arkit was deployed by the Department of Natural Gas & Petroleum Resources to manage project data, oversee budgeting and collaborate with contractors.